Sorry... the 2017 Jeep Wrangler Unlimited is no longer being sold as new. Instead, take the first step to a great deal on 2019 Jeep Wrangler Unlimited with a free price quote! 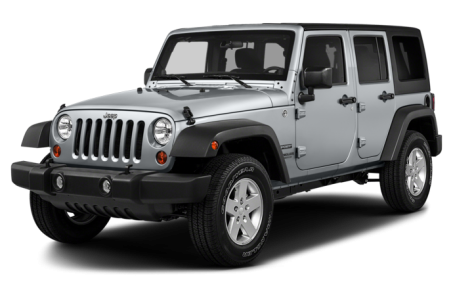 The 2017 Jeep Wrangler Unlimited is the 4-door version of the standard Wrangler compact SUV. It competes with the Ford Escape, Honda CR-V, and Toyota RAV4. The regular Wrangler will be covered in a separate overview. It has four trim levels: the Sport, Sport S, Sahara, and Rubicon. The Wrangler Unlimited has maintained the same rugged styling elements throughout its existence. It is characterized by its blockish side fenders, 7-slot front grille, and round headlights. This year, the Wrangler and Wrangler Unlimited gain newly available LED headlights and front fog lights. Much of the Wrangler Unlimited can be removed; the doors and roof come off after you loosen a few bolts and the windshield can fold down as well. Wheels range from 16-18 inches in size, with a full-size spare mounted on the rear gate. Side steps come standard for easier entry, while a removable hardtop is optional. Under the hood, the Wrangler Unlimited is powered by a standard 285-hp, 3.6-liter Pentastar V-6 engine mated to a 6-speed manual transmission or 5-speed automatic. 4-wheel drive comes standard with plenty of extra mechanical upgrades available like a 3.73 or 4.10 axle ratio, a rear-axle locker, and a sway bar disconnect system. Fuel economy for the Wrangler Unlimited is an EPA-estimated 16/21 mpg city/highway. Inside, the Wrangler Unlimited’s cabin is larger than the two-door Wrangler and the extra doors make it easier for rear seat passengers to get in and out. The interior opts for function over form, with a rugged aesthetic that carries over from the exterior. Standard features include satellite radio, an eight speaker stereo, cloth upholstery, and an auxiliary audio input. Also available are air conditioning, a 115-volt power outlet, navigation, an Alpine stereo, leather upholstery, and heated front seats. Standard safety equipment includes front airbags, antilock brakes, hill-start assist, and electronic stability control with roll mitigation. Side-impact airbags are optional. 115 of 117 (98%) consumers said they would recommend this vehicle to a friend.